Where the Monongahela and Cheat Rivers meet, Point Marion welcomes visitors looking for good food, outdoor recreation, and a bit of American history. Start with a big breakfast and friendly service at the family-owned Riverside Diner1, at 120 Penn Street. Then head three and a half miles north on Route 166 to Friendship Hill National Historic Site2. This 661 acre park was once home to Albert Gallatin, the longest serving United States Treasury Secretary. Open April through October, the Gallatin mansion features an informative visitor center, self-guided audio tour, and a short video. Tour the house, and then explore nearly ten miles of lovely trails winding down to the Mon. A picnic area and comfort station are adjacent to the parking lot. Entry is free year round. On your way back into Point Marion, fill your cooler at Shop ‘N Save Express3, located at 1 North Main Street. Drive south to Point Marion Community Park, a lovely green space on the banks of the Mon. Fish from the docks with live bait from Point Marion Hardware4, located on 126 Penn Street or just relax before launching your kayak, canoe, or boat. (Reminder: A boat registration or use permit is needed.) Head downriver, bearing left at the confluence of the two rivers. Six miles of leisurely boating brings you to the village of Greensboro. Exit here at the access area and enjoy a picnic at the gazebo before packing up and returning to Point Marion. 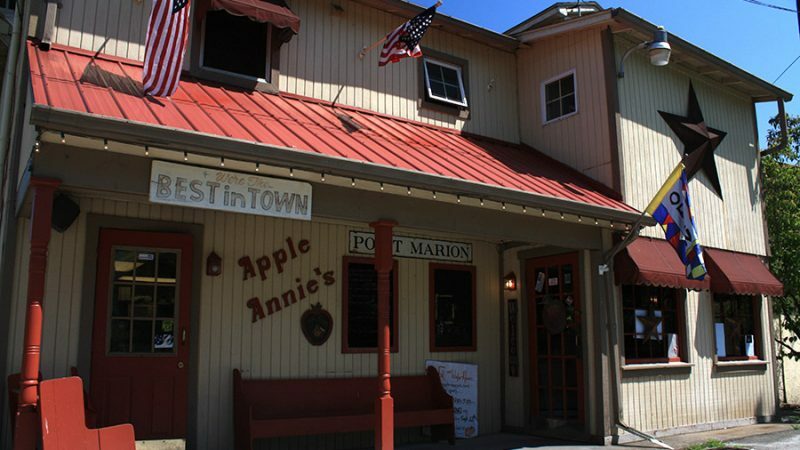 Don’t leave town without stopping at Apple Annie’s5, at 28 Church Street, a regional favorite for over 20 years. Open Tuesday through Saturday, this charming restaurant features home-cooked meals and an amazing array of delicious desserts, baked on-site. As you head for home, take Route 88 across the Greene County bridge and drive 15 miles to Carmichaels, where you can catch a flick at the Skyview Drive-In. Open only on the weekends, this is an old-fashioned way to end your visit to Point Marion!